Beginners Welcome! Experience not required. Prices includes all instructor fees, materials, and lunch. Judy Moore-Gist,Alexander Certified Instructor and Certified Ross Instructor, strives to give people of all ages the opportunity to experience both the "Magic" and Joy" Of Painting". Both, William (Bill) Alexander and Bob Ross, PBS TV hosts, have inspired thousands of first time painters. Demonstrating the "wet-on-wet" technique motivated people of all ages to pick up a brush and put their dreams on canvas. Judy will do the same, come take a class and see for yourself. 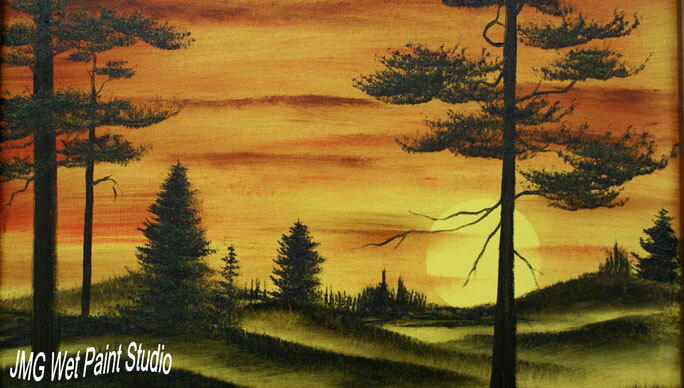 At the end of just one session you will be amazed at the beautiful painting that you created in just a few hours. You will become more aware of beautiful cloud shapes and colors you took for granted before. There is nothing more inspiring than seeing a beautiful landscape that you painted and others will treasure forever.